Exploring the back roads of the Mojave Desert is a rewarding experience – there is a real thrill when one tops a ridge or rounds a curve to find the remains of an abandoned mine, town or former roadside business. All is silent now; the place is empty and may be overgrown as the desert reclaims the land. But at one time, decades ago, people lived, worked and raised their families in these forgotten places. 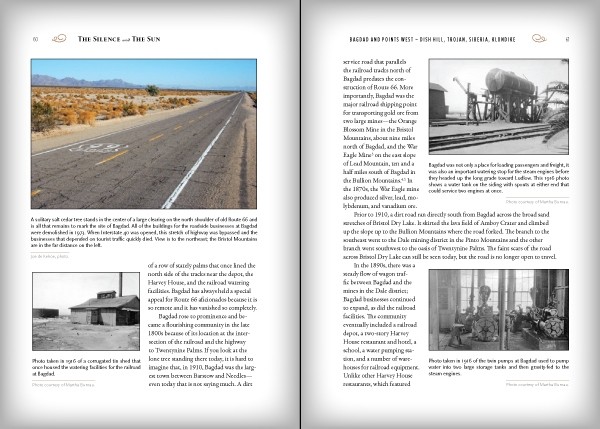 The Silence and the Sun offers a selection of historical accounts on the growth and eventual decline of some of these desert sites and stories of the people who lived there. Learn more about The Silence and The Sun here, including a table of contents, a list of maps in the book, and download a sample chapter! Chapter Twelve: What's In a Name? Click the button to download a sample chapter from the book. Below is an image from the sample. 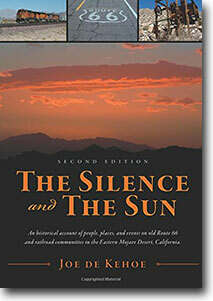 The Silence and The Sun has gotten a wealth of great reviews! Click here to read some of which Joe is most proud.